2 photographic prints : col. ; 41 x 51 cm or smaller. 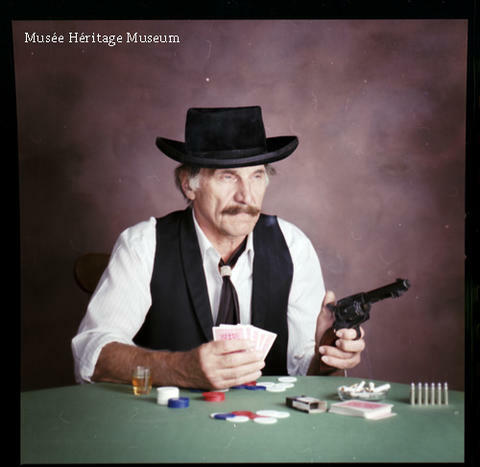 File predominately consists of photographs of Arnold Skitsko in cowboy outfit, holding onto a gun at a poker table. There is also one photograph of him in a fur coat and hat, holding a shotgun. Arnold Skitsko was a friend of Victor Post and owner of Copperfield Plastic Fabricators Ltd. in Edmonton. 1 oversize print has been separated and stored in Oversize Box 2. Currently in off-site cold storage.